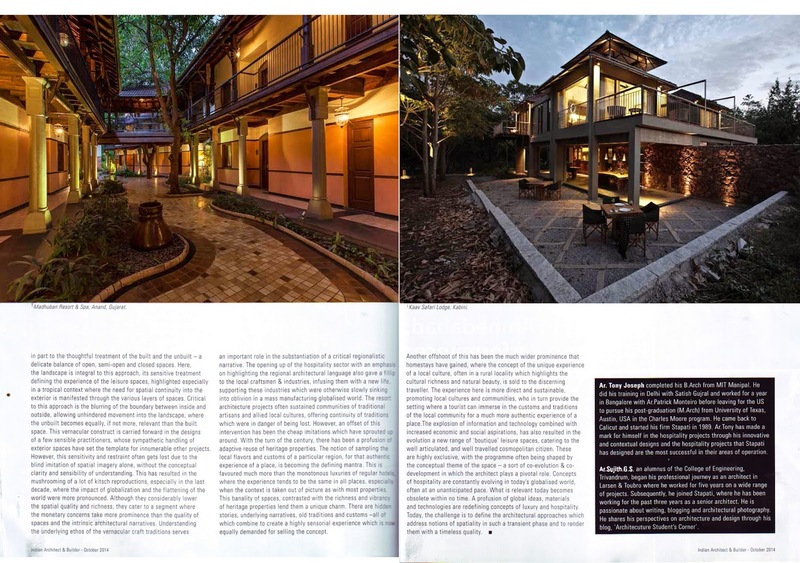 My article in INDIAN ARCHITECT AND BUILDER'S Anniversary Issue, along with Ar.Tony Joseph! Do check it out! A couple of awesome talks by Ar.Benninger and Ar.Peter Rich!! Benninger took us through his works, right from one of his first projects to the recent IIT project that he is doing, explaining his thought process and inspirations. He impressed upon us the need to develop our own architectural language and explained about the evolution of such a language through the chronology of his projects. Peter Rich's presentation was filled with slides of his drawings and hand renderings, which were truly amazing. What was truly inspiring was that during Benninger's talk, Peter Rich was intently scribbling notes and sketches in his sketchbook, constantly keeping on learning even at this age. 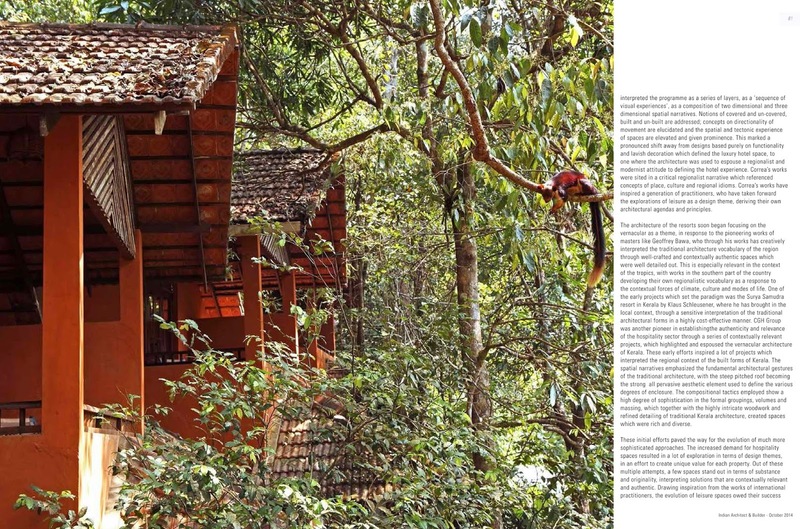 One of Peter Rich's strong advice to young architects were to travel across the length and breadth of India and study the vernacular and traditional architecture which the country had to offer. He was of the opinion that this would be the best form of learning for any young architect, learning from history and re-interpreting it in your designs. He further called for architects to become more of activists, standing up and raising their voice for causes that they believed in. All in all, it was a really inspiring talk. Helipads on top of High rises in India - is there a rationale? I was reading through the article regarding the Los Angeles' Mayor's announcement saying that for new buildings it wasn't mandatory to have helipads on top as per fire rescue guidelines, as they limit the city's skyline to flat topped boxes and wondered about the relevance of this rule in an Indian context. The intention behind the Mayor's move was to have a more interesting skyline for Los Angeles, giving architects the freedom to go beyond flat-tops. The logic behind this particular guideline, which is mandatory as per the National Building Code for buildings above 60m in height, is to have an escape mechanism for helicopter evacuation in case of fires in high-rise buildings. Although altruistic in intention, the practicality of landing a helicopter on top of a burning building needs to be analysed, with several experts felling that this is extremely dangerous. What is interesting is that Los Angeles was one of the few remaining cities in the US were this rule existed. Alternate mechanisms like separate elevators for firefighters, additional staircases etc. could be more effective and practical. In an Indian context, as was seen during the recent fire in Mumbai, helicopter evacuation was sought as a last resort to evacuate the trapped firemen. There also, the helicopter did not touch down on top of the building but only lowered the Navy sailor to rescue the trapped firemen. This does lead to question whether such a tactic can be employed instead of having a full fledged helipad on top. There have been plenty of instances where the DGCA has refused permission to land a helicopter on top of these helipads citing safety concerns. If the helipads are seen unsafe by the aviation authorities then why bother having them in the first place? More than any aesthetic consideration, one needs to wonder whether spending such a lot of extra money for the structural design and reinforcement required for erecting a helipad on top of a high-rise building is worth the expenditure if it is not going to be of much practical value. This is especially relevant in high-rise residential developments where this cost accrued to the builder is directly transferred to the resident. We need rules and regulations which work, which are practical and which takes into consideration all the stakeholders and not merely rules which exist on paper for a feel good factor. We must also understand that the value of a life is paramount and should not be compromised at all. It is high time that we rationalize the regulations and take into confidence the building community so that they do not cut corners and come up with inventive solutions to work around ineffective rules. It is thus critical that we revisit these regulations and reframe rules which are really effective and relevant in today’s context. Parallelly, we need to strengthen and better equip our fire services to deal effectively with emergencies in high-rises. The Los Angeles announcement has come at just the right time for us to introspect on our situation and address the existing concerns.